Strolling through one of the vast spruce-fir forests in north America on a sunny summer’s day, you might think that, in the green world around you, nothing ever happens in a rush. However, researchers have discovered that the bunchberry dogwood plant (Cornus canadensis), which carpets the ground of these forests, doesn’t dawdle when it comes to flower opening. Photo by A. Acosta, J. Edwards, M. Laskowski and D. Whitaker, see ref. 2. 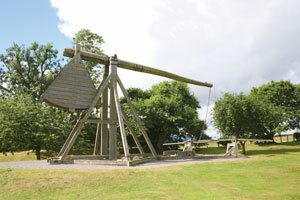 Actually, people have indeed learned to achieve such feats—through the use of tools such as the trebuchet (pictured above), a specialized projectile-launcher used in medieval wars.13 The trebuchet is ingeniously designed, using principles of physics (leverage) to propel objects (and sometimes, reportedly, an unfortunate negotiator14) much further and faster than would a simple catapult. Surely, given the medieval trebuchet was intelligently designed, then so too was the bunchberry flower? (And the Designer of the bunchberry flower thought of it first!) In fact, the researchers’ paper in the journal Nature apparently couldn’t help but use such language: ‘Bunchberry stamens are designed like miniature medieval trebuchets … ’2 [our emphasis]. All of this points (Romans 1:20) to the logical conclusion that the bunchberry’s ‘bang’ did not come about by accident. Angell, S., Professors record the world’s fastest plant, Oberlin College News & Features, <www.oberlin.edu/news-info /05may/expflower.html>, 12 May 2005. Return to text. Edwards, J., Whitaker, D., Klionsky, S., Laskowski, M., A record-breaking pollen catapult, Nature 435(7039):164, 2005. Return to text. Burrows, M., Froghopper insects leap to new heights, Nature 424(6948):509, 2003. Return to text. See also Catchpoole, D., In leaps and bounds—the amazing jumping prowess of frogs and froghoppers, Creation 30(4):40–41, 2008; <creation.com/leaps>. Return to text. Patek, S., Korff, W. and Caldwell, R., Deadly strike mechanism of a mantis shrimp, Nature 428(6985):819–820, 2004. Return to text. See also Sarfati, J., Shrimpy superboxer, Creation 30(2):12–13, 2008; <creation.com/shrimpy>. Return to text. Snelderwaard, P., de Groot, J. and Deban, S., Digital video combined with conventional radiography creates an excellent high-speed X-ray video system, Journal of Biomechanics 35:1007–1009, 2002. Return to text. Sarfati, J., A coat of many colours—captivating chameleons, Creation 26(4):28–33, 2004; <creation.com/chameleon>. Return to text. 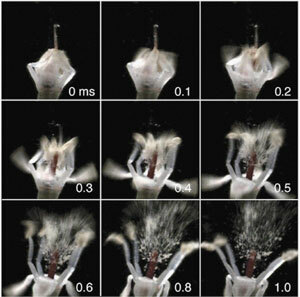 Forterre, Y., Skotheim, J., Dumais, J. and Mahadevan, L., How the Venus flytrap snaps, Nature 433(7024):421–425, 2005. Return to text. 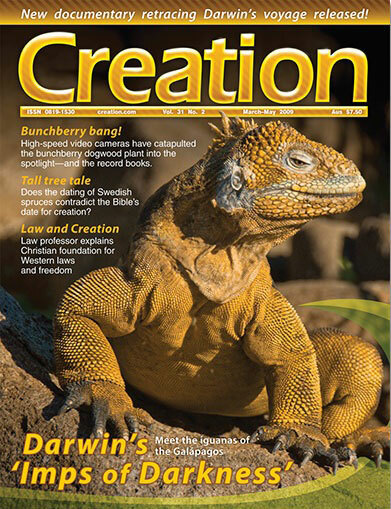 See also Sarfati, J., Venus flytrap—ingenious mechanism still baffles Darwinists, Creation 29(4):36–37, 2007; <creation.com/flytrap>. Return to text. Schirber, M., World’s fastest plant: New speed record set, Live Science, <www.live science.com/othernews/050512_exploding_pollen.html>, 12 May 2005. Return to text. Sohn, E., Fastest plant on Earth, Science News for Kids, <www.sciencenewsforkids.org/articles/2005 0615/Note3.asp>, 24 August 2006. Return to text. Trebuchet.com—the atomic bomb of the Middle Ages, <www.trebuchet.com>, 1 December 2006. Return to text. All about catapults, <www.catapults.info>, 1 December 2006. Return to text. Again, our emphasis in bold font. Ref. 2. Return to text. The catapult mechanisms of chameleon tongues and horse legs are similarly irreducibly complex. That is, both ‘spring’ and ‘release’ systems must be fully in place for the catapult to work—evolution’s hypothetical small intermediate steps would have no advantage by themselves, therefore natural selection would not favour them. See ref. 8—Box: ‘Chameleon catapult’; and Sarfati, J., Horse legs: the special catapult mechanism, Creation 25(4):36, 2003; <creation.com/horselegs>. Return to text.